> Pellè - Was it a penalty? Cold; absolutely, horribly cold – that was the hearts of the home fans streaming away from the stadium on Saturday evening. It was also the weather we awoke to on Saturday. It was 3C on Ryde beach with gale force winds driving the temperature down below zero. Despite this, I made no effort to find out what was or wasn’t operating on the Solent and glibly turned up at East Cowes to find “no vehicle ferries before 3pm.” I’d already made an emergency dash to Waitrose for aspirin and paracetamol, having left my pill case at home. Now I faced the prospect of a mad dash to Cowes to catch the Red Jet which supposedly was running. Outside the hospital at Parkhurst the traffic ground to a halt – on the way home I found there were roadworks down the hill near the prisons. Impatiently I turned around and drove round Parkhurst forest and into Cowes via Gurnard. It cost £5 to park in Cowes: in East Cowes it is free. I’d already made my mind up it was going to be a crappy day. At least the Red Jets being small, nimble and streamlined, were operating normally and I was soon on the bus to St Mary’s. Walking up to the stadium I treated myself to a birthday death-burger with cheese, onions and red sauce. My spirits began to lift. It was still bloody cold but at least inside the stadium the edge was taken off the wind. My matchday magazine had arrived before I set off but rather than bring it along I’d tucked a photocopy of the team-sheets inside my notebook. Steg arrived and helped me record the starting XIs. Big Vic was back from suspension and, surprisingly, Long replaced Mané for Saints. Stoke were unchanged from their win against Chelsea: unsurprising when you consider they last conceded a league goal away from home on the 12th September. The teams and officials stood together in the centre of the pitch as the French national anthem was played as a show of solidarity with the French nation following the horror of terrorist attacks in Paris. Why spectators felt it was necessary to clap during the anthem I cannot fathom. Stoke chose to kick towards the Northam so Saints got the game underway. The away side wore their black strip with a green sash on the shirt which would look good on more attractive players. The game started with tentative exchanges and possession was traded for the first few minutes. Saints made the first significant progress down the left but Johnson shut down Tadić’s approach play. Moments later Clasie and Davis created a shooting opportunity for the Serb but he dragged his effort wide of the far post. Stoke’s first attack saw Arnautovic blocked by Fonte. On 10 minutes Clasie tried to find Davis but Johnson intercepted and set Shaqiri away down the right. The Swiss winger came inside to find Arnautovic in the middle but he swept the ball on to the left where Pieters charged into view. His low cross was met by Bojan at the near post and clipped past Stekelenburg. It is a rare thing to see Fonte caught so unawares as he was by Bojan’s dart behind him. 0-1. Stoke were visibly lifted and 2 minutes later Bojan was at it again – this time his shot went over the bar. Saints continued to look to Tadić on the left to make things happen. He beat Johnson with a curling cross, headed out by the Stoke defence. The ball dropped invitingly for Cédric whose desperately poor shot sailed horribly wide. On 14 minutes Saints went long – a lofted pass dropped towards Pellè but an acrobatic clearance by Wollscheid turned the ball to safety. My fingers were so cold by now I had to put gloves on. From this point my writing was so bad I’m having difficulty reading it now! Stoke were always looking to get upfield and the next 2 chances fell to them. First Bojan set up Shaqiri whose shot was well saved by Stekelenburg. From the resulting corner the ball was fed back to Charlie Adam but his shot was wildly off target. Saints were then back on the attack. An inviting knock down by Pellè deserved better than Davis stood watching as Stoke cleared their lines. The ball was returned into the box and despite going over, Pellè tried to turn the ball in from a prone position. Stoke again got it away. On 21 minutes Shaqiri fouled Tadić giving Davis the chance to drop the free kick into the Stoke goalmouth. Fonte rose to meet his cross but directed his header too high. Stoke went up the other end and won a corner - Bojan’s cross falling to Clasie who carried the ball upfield. Saints next attack saw Bertie’s cross safely held by Butland. Stoke continued to match us and, disappointingly, looked the better organised side. Alongside their foreign stars, shades of the old, uncompromising Stoke remain. They were continually testing what level of physicality they could get away with – and Lee Mason was letting plenty go. Saints then fashioned a chance for Clasie who screwed his shot wide. On 29 minutes came the brightest part of the first half: Steg went to get the half-time coffee early. 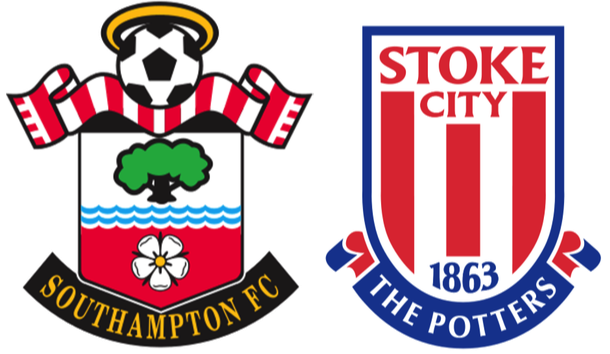 Saints meanwhile continued to enjoy good possession but never quite delivered an end-product. Stoke held firm then on 34m swept down field but Arnautovic fired over. Another foul on Tadić saw Davis hit another cross into their box. Instead of comfortably catching it Butland fumbled the ball but Big Vic stuck it wide. On 36 Stoke won another corner. Saints smuggled the ball to Tadić who carried it the length of the pitch – then put his shot wide. Then Adam broke up the next Saints attack, hoofing the ball high into the air. Long won another corner – Tadić’s cross was headed out to Cédric (I felt a sense of deja-vu) and he struck an awful shot high into the Chapel. Big Vic was fouled by Adam; Tadić elbowed by Johnson; then Cédric got another head wound requiring treatment. None of this warranted any action by our truly dreadful referee. We were promised 2 added minutes but he played about 40 seconds. Everyone looked keen to get out of the cold and hurried off. HT 0-1. I put on both gloves and drank my coffee. Neither side changed personnel but Stoke were quickly on the front foot after the restart. They moved the ball down the left to Arnautovic who played a neat ball in to Shaqiri whose shot did the move no justice. Stoke stepped up the sly shoves and blocks, clearly encouraged by the poor standard of refereeing. Shaqiri had another pot on 49m and was wide of the mark again. On 51m Saints were awarded a free kick sending the home fans into raptures. Saints then enjoyed their best period of the match, pinning Stoke into their box winning a number of corners. None of these came to much, all too often Butland was able to claim the ball under little pressure. On the one occasion Pellè got his head on a cross he got too little on it to do any harm. On 55m I saw Crouchie warming up I front of us. Shortly afterwards Tadić created a shooting chance for Victor but the #12 dragged his shot just past the post. Substitutions started on 63m with Mané on for Clasie and Affelay replacing Shaqiri. On 66m Long went over in the box and the crowd screamed for a penalty. As the incident didn’t make MOTD I can only assume it wasn’t one. On 70m Mané worked a shooting position and finally forced Butland into a save. A minute later Stoke brought on Cameron for Bojan which suggested they were shutting up shop. Saints then brought on JWP for Davis. The industrious Long won yet another corner but the end result was another Stoke breakaway. Thankfully Arnautovic skyed his shot. On 77m JWP made his first tackle and was promptly booked. It was down the other end but looked nothing from my seat. Saints then won a free-kick: Fonte got his head on the cross but missed the target. Up the other end Adam fired over the top but their next effort from Affelay crept just beyond the post. Saints surged back upfield and a ball was lofted into the box. As Pellè rose to head the ball he was felled by Wollscheid and left in a heap: nailed on penalty – unless your name is Mason. Saints continued to press but had little luck and sadly no incisiveness. Pieters had a hopeful shot wide before Saints made their final change, Juanmi for Cédric. Adam immediately exploited the space down our right, crossing for Walters to head wide. The Irishman was immediately benched, replaced by Diouf. By this time my bladder was fit to burst so I legged it downstairs. As I adjusted my dress I heard the announcer say '4 added minutes' and decided to clear off. Whilst I missed Pellè's booking, that decision enabled me to catch the 17.15 Red Jet so that, about an hour later, I was indoors with a doner kebab watching Citee v Liverpool. I’ve had better birthdays to be fair but writing this report has reminded me of the effort both sides made. There were plenty of chances but very little quality finishing – apart from that one strike by Bojan. MoM: If I gave the award for ruining the match, Lee Mason would win hands-down. I’m not confident it is proper to give MoM to an opposing player so my nomination is Stekelenburg, without whom we could have lost by a greater margin.